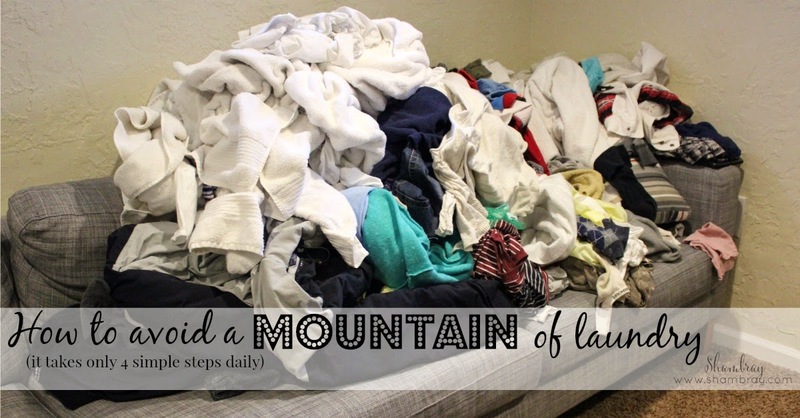 How many of you have suffered from the "laundry mountain"? Does the above picture look familiar at all? It is such a daunting task when it gets this bad. I founds a solution years ago that has helped me so much. I used to do laundry all on one day. Looking back I have no idea why, but talking to so many people about laundry I realized I was not the only one. There are a lot of people that have "laundry day". That is basically want I did. It was on Saturday because that was my day off. Yuck. That makes Saturday so terrible and that is coming from someone that doesn't mind laundry (now dusting and washing dishes are another story). So now I do laundry daily. Now some of you laundry haters might be saying, "Shambray! Are you nuts!? I don't like laundry. Why on earth would I do it EVERY. SINGLE. DAY." I will tell you why. Because it is far more manageable if done daily. Before you hurry up and leave the blog let me explain how simple it is. I will break it up into simple steps (that we all know already) and give you my time frame that it takes me to do it. I like to make Sunday my day off except for the bare minimum. We all deserve a day off right? So on the given day I focus on that one group of clothes. Some weeks I do not have any delicates. Do you know what that means for me? DAY OFF! Whoop whoop! If I follow this schedule then I have clothes when I need them and that is a wonderful feeling. 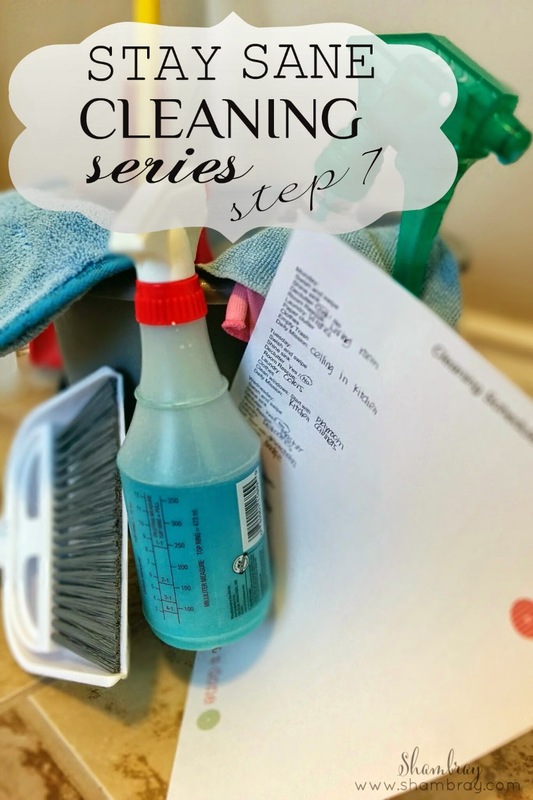 Now for the steps that are involved in this step of the Stay Sane Cleaning Series. (Oh and by the way laundry is the last step of the series that is done daily.) Everything else is done weekly. 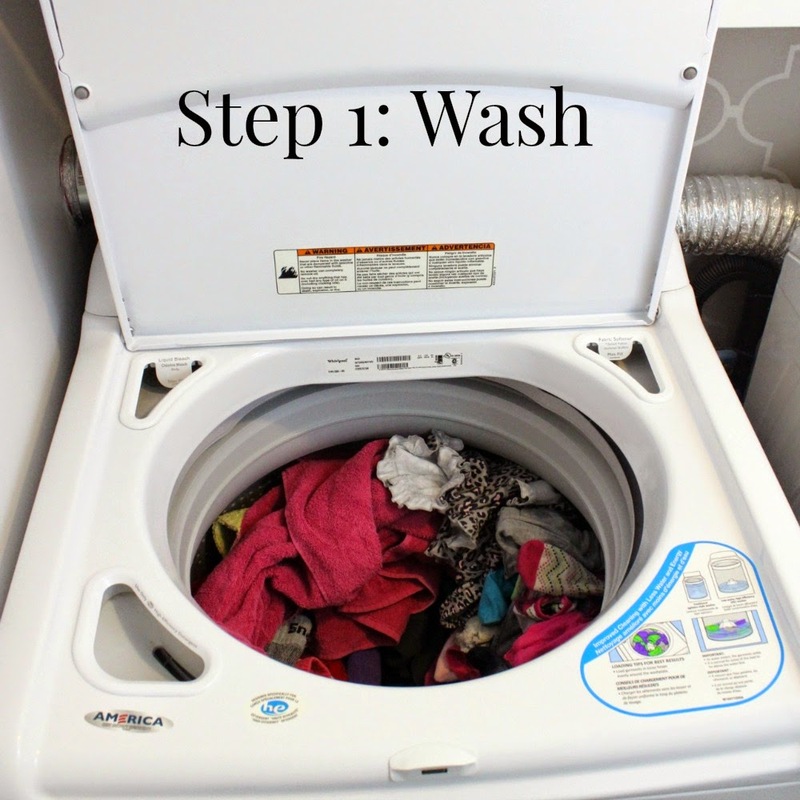 As simple as that take the clothes that you are washing that day and put them in the washer with soap and turn on the washer. Then walk away. This seriously takes me 1-2 minutes. Once the load is washed then I take it and put it in the dryer immediately. Add a dryer sheet and turn on the dryer. Again, this step takes 1-2 minutes tops. 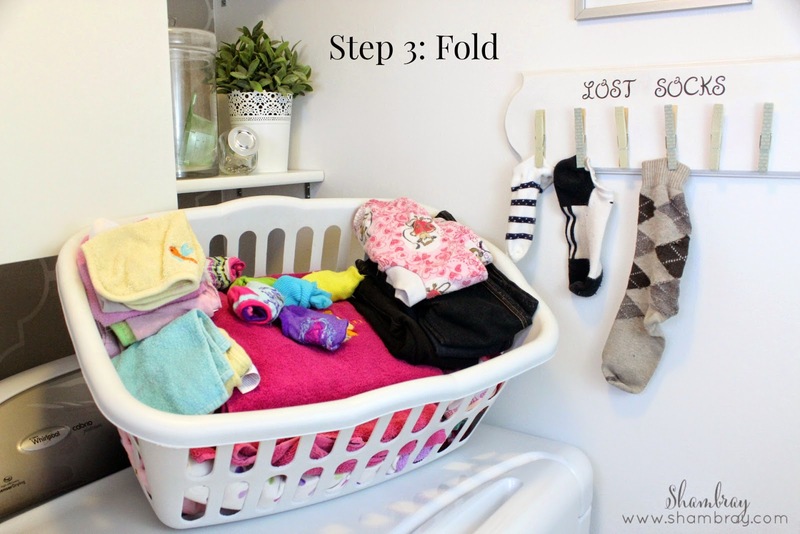 As soon as the clothes are dry I fold them. This usually takes me 5-6 minutes. I sometimes watch a show while folding laundry and I am finished in no time (at least it seems). Then IMMEDIATELY put the clothes away. Please don't wait or else it might not get done. 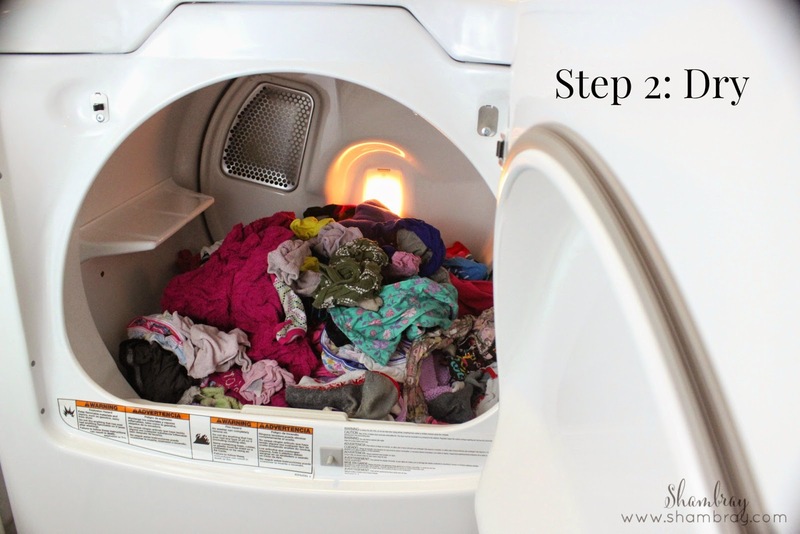 This step takes 5-6 minutes as well. So if I do the math this step of the Stay Sane Cleaning Series could take anywhere from 12-16 minutes a day. That is not bad. There are lots of breaks in between to give you a rest from the dreaded task. 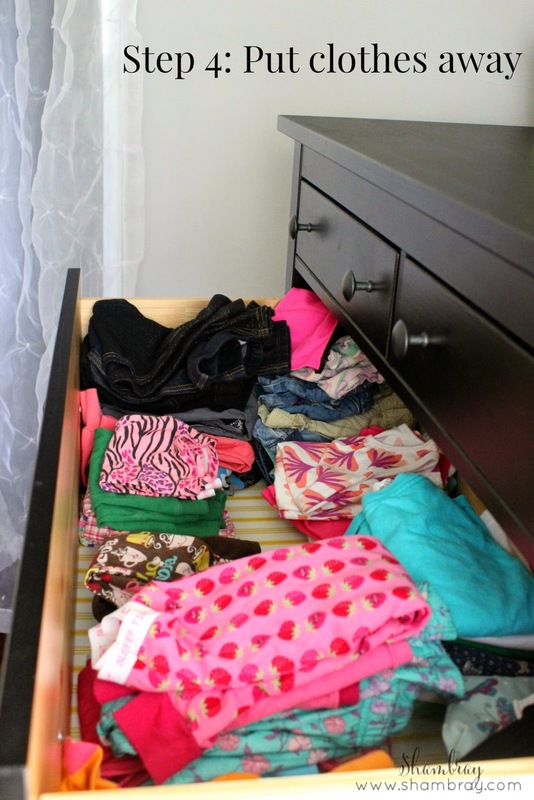 How many of you do laundry daily vs. weekly? Been doing it daily for years. With 9 children, if I don't do it daily it gets totally out of control! When all my kids were at home it would often be 2-3 loads per day. Now it's 1-2 and if I'm lucky I get a day off here and there!